Introduction: The Superior Shoulder Suspensory Complex (SSSC) is a ring-shaped structure that plays important role in stability, biomechanics and overall function of the shoulder (3). Triple disruptions (TD) of SSSC during a single trauma are extremely rare events. This paper presents a rare case of TD and a comprehensive review of the literature. Case report: A 30-year-old man presented a combination of fracture of the base of coracoid process, AC joint dislocation and fracture of the spine of scapula with reduction of subacromial space. He was treated surgically by a dual approach, reducing and fixing all three lesions with an excellent outcome at 3 months after surgery. Discussion: After literature search we found only 41 multiple SSSC injuries. The most prevalent structure injured was the coracoid (70.73%). When considering possible bias for diagnosing TD, like fractures of mid-shaft clavicle, the number of “true” TD decreased to 23. This significant number of misdiagnosis calls attention to confusion between the concepts of floating shoulder and SSSC, which reflects in low reliability of diagnosing (41.46%). Conclusion: Although triple disruptions of the SSSC are very rare, they may be becoming more frequent due to an increasing high-energy accidents caused by motor vehicles. As proposed by Goss, the treatment of these lesions must fix no less than the total number of SSSC structures injured minus one. Key words: Superior Shoulder Suspensory Complex, Double disruptions, Acromion, Coracoid, Acromioclavicular, Floating Shoulder. The Superior Shoulder Suspensory Complex (SSSC) is a ring-shaped structure that plays important role in stability, biomechanics and overall function of the shoulder (3). It comprises the distal end of clavicle, acromioclavicular (AC) joint, acromion, glenoid and coracoid processes, and coracoclavicular ligaments. Disruptions of the SSSC in a single spot due to an AC joint dislocation are very common injuries often treated conservatively as stability of SSSC structure remains intact. Double disruptions, like AC joint dislocation together with coracoclavicular ligaments tear, destabilize SSSC ring and are susceptible to delayed union, malunion and nonunion, as well as adverse long-term functional limitations to the shoulder (5). Therefore, double brakes usually require operative treatment to regain stability of the system (3,5). Triple Disruptions (TD) of SSSC during a single trauma are extremely rare events. In fact, only 41 cases have been reported so far (8,9,10,13,15,16,17,20,21,24,25). Although some authors published injuries claiming to be TD, many of them are not true TD, but in fact double disruptions (DD) (13,17,20,21). 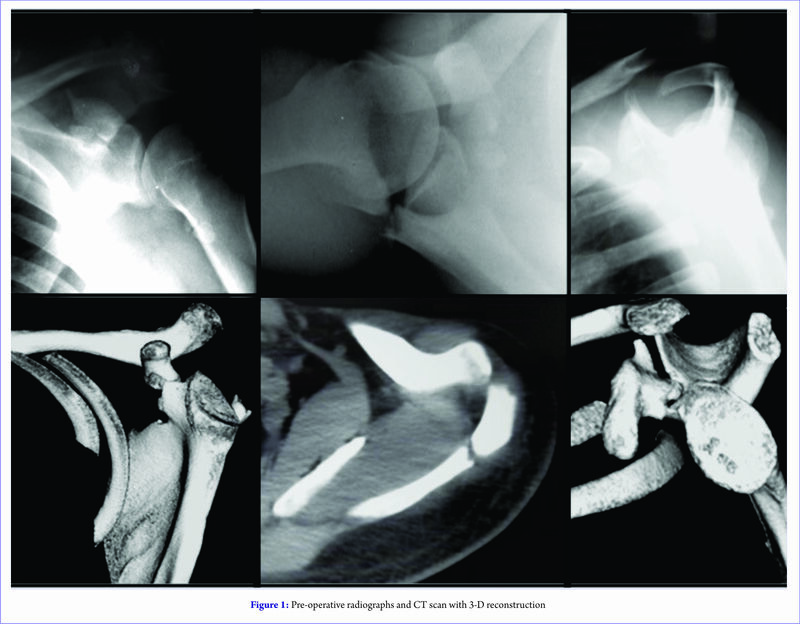 This paper presents a case of a patient presenting combined fractures of coracoid and scapular spine together with an acromioclavicular separation after a severe motorcycle accident. This injury pattern was only reported once before (20). It is also the first report of a triple disruption of the SSSC in South America. A 30-year-old man without previous shoulder injury experienced direct trauma to his shoulder during a motorcycle crash. He was taken to the emergency care center with a chief complaint of intense pain to his left shoulder. Although he had suffered a head trauma and did not remember details about the accident, initial evaluation and CT scans excluded major head, spine or vital organs injuries. Physical exam revealed tenderness, swelling and a bruise at the top of his left shoulder, pain to palpation of AC joint and crepitation over the anterior aspect of shoulder. Although no definite neurovascular abnormalities on the left upper extremity were found, there were important range of movement limitations due to pain, as follow: active shoulder forward flexion/abdution of 90º/80º, reaching 110º/90º passively; 30º external rotation; and internal rotation up to the sacrum. Initial left shoulder radiographs showed a fracture of the base of coracoid process (Ogawa classification type I) (19), a 15mm AC joint dislocation and a fracture of the spine of scapula with reduction of subacromial space (Kuhn classification type III (11)) [Figure 1]. A left shoulder computed tomography scan with three-dimentional bone reconstruction was done to better understand fracture pattern and to plan surgical treatment. It showed a 27º inferior tilt of distal scapular spine and acromion significantly reducing the subacromial space, and a 38º rotational displacement of the coracoid fragment. Scapular spine fracture line clearly did not reach the spinoglenoid notch, classified as type I of Ogawa&Naniwa classification (18), which means less risk of suprascapular nerve being damaged. [Figure 1]. Surgery for SSSC complex repair was undertaken on the 7th day post-injury. Under general anesthesia, with patient in beach-chair position, a longitudinal approach over the spine of scapula extending to lateral acromion was adopted. Suprascapular nerve was identified and the scapular spine was fixed using a reconstructive 3.5mm plate and six cortical screws. Intra-operative fluoroscopy just after this first stage continued to show displacement of AC joint and coracoid fracture. So a second ‘saber-cut’ approach had to be done in the anterior aspect of the left shoulder in order to access both coracoid and AC joint. Lacerated meniscus was removed allowing AC joint reduction and provisional fixation using a 2.5mm Steinmann pin oriented from distal clavicle to the spine of scapula just medial to fracture site. Both coracoclavicular ligaments were intact when inspected. Finally, the coracoid fracture was reduced and fixed using a 3.5mm cannulated screw under fluoroscopy. After meniculous reattachment of deltoid, the wound was closed in layers. A CT scan was repeated on the first day post-operatively to evaluate correct position of the coracoid screw [Figure 2]. Postoperatively, the patient received a continuous sling. Active hand, wrist and elbow motion were encouraged since immediately after surgery but shoulder was restrained until 6 weeks after surgery, when the Steinmann pin was removed and shoulder rehabilitation started. Both factures healed and a full painless range of shoulder motion was obtained in a 3-month period. The patient was followed for 2 years and had excellent functional outcome at the last follow-up, returning to sports activities unhindered [Figure 2]. Fractures of the scapula result of high-energy traumatic events, like motor vehicles accidents and falls from heights (1). They affect mainly 30 to 45 year-old male adults (1). These relatively rare injuries account for 3-5% of all fractures involving the shoulder girdle and 1% of all fractures. Direct trauma to the lateral aspect of shoulder is the most common mechanism of injury causing scapular fractures (1). Coracoid fractures account for 2-5% of all scapular fractures. Ogawa et al. (20) reported 35 coracoid fractures and found among them 67% of double disruptions (DD) of the SSSC and 28% of triple disruptions (TD) in a 34 year-time period (1974-2008). It shows how rare TD lesions are. Our study analysed 41 TD and coracoid was found to be the most SSSC structure fractured in these injuries (70.73%) [Table]. Acromion fractures account for near 8% of all scapular fractures. In our review we found acromion fractures in 56.10% of TD. It was the second most prevalent SSSC structure injuried among TDs, tied with AC dislocations [Table]. As up to 90% of all scapula fractures are non-displaced or minimally displaced and so they can be treated conservatively using slings or braces (1,4,5,23), it took long time until surgical treatment of scapula fractures has come to spotlight, which only occurred in the nineties. There has been a growing body of scientific literature around double disruptions of the SSSC and floating shoulder injuries lately, which indicates that these injuries may not be as rare as originally proposed (17). The Superior Shoulder Suspensory Complex (SSSC) was described by Goss in 1993 as an osteoligamentous ring located around distal clavicle and scapular junction, which have ultimate importance in shoulder biomechanics (3). It comprises the distal end of clavicle, acromioclavicular (AC) joint, acromion, superior glenoid and coracoid processes, and coracoclavicular ligaments (3). Isolated disruptions to the SSSC with minimal or moderate displacement, like AC dislocations grades I and II of Rockwood classification (23), do not affect stability of the SSSC ring allowing them to be successfully treated conservatively. On the other hand, double disruptions of the SSSC injuries make the SSSC ring unstable affecting shoulder biomechanics. They involve several combinations of injuries to SSSC structures deeply related to each other, whose treatment is still challenging. In the past, assessment of double disruptions of the SSSC was made in an isolated manner, which frequently took to inadequate treatment since biomechanical correlation between SSSC structures was unknown. Then, Goss made these injuries easier to comprehend as he compared SSSC to a ring(3,4,5), where every structure of the ring correlates to each other to grant stability to the system. So, surgical treatment must restore at least one of the SSSC lesions in order to restore ring stability and, by doing that, it indirectly reduces and stabilizes the second break (3). Without proper surgical repair these injuries commonly evolve to delayed-union, nonunion or mal-union, leading to a long-term dysfunctional shoulder (3). However, there is still missing trials that approach long-term shoulder dysfunction after conservative and surgical treatment for double disruptions of the SSSC. Ganz and Noesberger (6) described in 1975 a combined ipsilateral fracture of mid shaft clavicle and scapula neck, known as “Floating Shoulder”. Although described much earlier than the SSSC, this concept poses confusion to the diagnosis of SSSC lesions. When one tries to mix Floating Shoulder to the SSSC concept, it is common to see misdiagnosis. Mistakes usually happen when one consider mid-shaft clavicles as a part of the SSSC. It is not rare to see misdiagnosed DD by including scapula body and glenoid intrarticular fractures as well. Most articular glenoid fractures do not disrupt the SSSC. In fact, the only ones that do affect the SSSC are Goss-Ideberg types III and variants(4). Triple disruptions (TD) of the SSSC are indeed very rare injuries. Generally they are much more unstable than a double disruption. So they require surgical stabilization of at least two structures in order to restore stability of the ring. Although there is none evidence-based guidelines for much complex injuries, most surgeons follow the same principles proposed by Goss for treatment of DD of the SSSC. Almost all published studies addressing TD injuries are case reports of surgical treatment and they have demonstrated good outcomes so far. Only one case report treated conservatively a 74-year-old men who, despite oriented about the severity of his lesions (AC dislocation, acromion, coracoid and posterior glenoid border fractures), decided not to operate and presented reasonable functional outcomes after one year(25). Although our case report did not presented any associated lesion, several reports mention associated injuries to SSSC disruptions, like rib fractures, proximal humerus fractures, spinal trauma, braquial plexus and peripheral nerves injuries, and hemothorax. As some of these are life-threatening injuries, they might contribute to the low prevalence of TD of the SSSC. After a comprehensive literature search we found eleven studies about multiple (more than two) SSSC injuries(8,9,10,13,15,16,17,20,21,24,25). Most papers describe the author’s experience of treating SSSC lesions through various techniques (8,10,15,16,24). From the 11 studies analysed in this study, 8 of them (72.72%) are case reports (8,9,10,13,15,16,24,25) and all but one describe surgical treatment (25). The largest series found include 15 patients with greater than two disruptions of the SSSC (12 triple and 3 quadruple ruptures). It is the only level IV therapeutic study available until now(17). All injuries presented on that paper affected mostly men with a mean age of 35 years. They resulted from motorcycle and snowmobile accidents, motor vehicle collisions and falls from heights. Considering the high-energy of trauma involved on TD of the SSSC, some authors believe these injuries could not be caused by a single impact to the shoulder, but rather they must result from multiple impacts during one severe high-energy trauma event. It also explains the significant number of concomitant associated injuries found on that study (87%), which delayed surgical treatment of the SSSC in mean 23 days. Such complex traumas demanded operative treatment for all 15 patients and 67% of them required more than 1 surgical approach to adequately restore alignment and stability of the SSSC. Post-operative functional scores (DASH and SF-26) and shoulder range of motion were good at mean follow-up of 30.7 months, with very low rate of complications, except for a mean overall decrease of 64.33% in shoulder strength for forward flexion, abduction and external rotation compared to the non-injured side. After plotting information from all 11 studies analysed, a total of 41 multiple disruptions of the SSSC were found. 35 (85.36%) were initially considered triple disruptions (TD) and 6 (14.64%) quadruple disruptions (QD). The most prevalent SSSC structure injured on these complexes traumas was the coracoid process (70.73%), followed by acromion (56.10%), clavicle (56.10%) and AC joint (56.10%). TD involving fractures of scapula spine, like the one presented on this case report, were the most rare, with only 2 cases reported (4.88%). Before this, only one similar case report had been published. When taking into consideration possible bias for diagnosing TD and QD of the SSSC, like fractures of mid-shaft clavicle, scapula body and glenoid cavity fractures, the number of “true” TD and QD decreased to 23 and 1 respectively. The main cause of misdiagnosis occurs when mid-shaft clavicle fractures are considered as an SSSC rupture (62.50%). In fact, according to Goss, mid-shaft clavicle fractures are not considered disruptions of the SSSC, neither scapula body (23.53%) nor glenoid edge fractures (13.97%). The significant number of misdiagnosed TD (52.17%) and QD (83.33%) calls attention to the very confusing interaction between the concepts of floating shoulder and the SSSC, which reflects in low reliability of diagnosing multiple simultaneous SSSC structures disruptions (41.46%). Le Coq et al (13) published in 2001 the first case report of a triple disruption of the SSSC. It was a combination of fractures of acromion and coracoid processes and a non-displaced mid-shaft clavicle fracture, which by definition is not a SSSC structure. So, in fact, it was a double disruption (DD) instead of a “true” triple disruption as proposed. The fact that he only had to fix the coracoid to obtain stability of the shoulder joint confirms the SSSC ring was only disrupted in two sites. Other authors also committed similar errors(9,20,21). Recently, Kim et al (9) reported a combination of AC dislocation, coracoid and mid-shaf clavicle fractures as a triple disruption, but that was in fact a DD. Toft et al (25) published the first QD of the SSSC treated non-operatively, but among the ruptures described there was an articular glenoid edge fracture that, despite needed fixation, is not a true SSSC disruption. From the 6 cases of QD ever published(17,21,25), only one is a “true” QD (17) and it is still one of a kind. It calls attention to the extreme rarity of QD lesions. Perhaps the reason for that is the supreme energy necessary to disrupt the SSSC ring in four concomitant sites. Due to the rarity of triple disruptions, like in the others case reports, this case exhibits a possible surgical treatment based on techniques previously described for double ruptures of the SSSC. None technique presented can be considered as ‘gold standard’, neither superior to any other treatment option. Despite this case showed excellent outcomes in a 2-year follow-up after surgery, there is no long-term guarantee that this patient will preserve a functional and pain-free shoulder. At last, the low reliability in making a correct diagnosis of multiple concomitant SSSC disruptions presented in this comprehensive revision of the literature overclouds even more the understanding of such complex injuries and slow the settlement of treatment guides. Although triple disruptions of the SSSC are very rare, they may be becoming more frequent due to an increasing high-energy accidents caused by motor vehicles. CT scans are important tools to better understand injuries patterns and to plan surgical treatment. Goss’ SSSC principles should be followed straightly in order to avoid misdiagnosis of triple and quadruple disruptions of the SSSC. Treatment of these lesions must also follow Goss’ principles, taking into consideration the scarce treatment trials available. The number of structures to be fixed may vary in each case, but it must not be less than the total number of SSSC structures injured minus one. 1. Ada JR, Miller ME. Scapular fractures. Analysis of 113 cases. Clin Orthop Relat Res. 1991; 269:174–80. 2. Egol KA, Connor PM, Karunakar MA, et al. The floating shoulder: clinical and functional results. J Bone Joint Surg Am. 2001; 8:1188-1194. 3. Goss TP. Double disruptions of the superior shoulder complex. J Orthop Trauma. 1993; 7:99-106. 4. Goss TP, Owens BD. Fractures of the Scapula. In: Rockwood CA Jr, Matsen FA, editors. The Shoulder. 4th ed. Vol. 1. Philadelphia, PA: Saunders/Elsevier. 2009; pp333–80. 5. Goss TP. Scapular fractures and dislocations: Diagnosis and treatment. J Am Acad Orthop Surg. 1995; 3:22–33. 7. Hak DJ, Johnson EE: Avulsion fracture of the coracoid associated with acromio-clavicular dislocation. J Orthop Trauma. 1993; 7:381-383. 8. Jung CY, Eun IS, Kim JW, Ko YC, Kim YJ, Kim CK. Treatment of triple fracture of the superior shoulder suspensory complex. J Korean Orthop Assoc. 2011; 46:68–72. 9. Kim BK, Dan J. A triple disruption of the superior shoulder suspensory complex mstaken for a Double disruption: a case report. Arthrosc Orthop Sports Med. 2016; 3:45-48. 10. Kim SH, Chung SW, Kim SH, Shin SH, Lee YH. 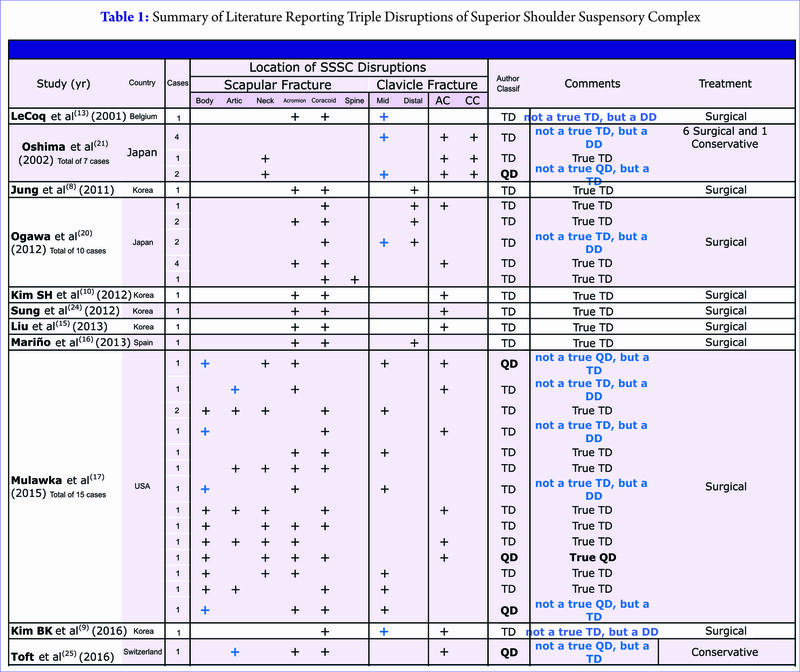 Triple disruption of the superior shoulder suspensory complex. Int J Shoulder Surg. 2012; 6:67-70. 11. Kuhn JE, Blasier RB, Carpenter JE: Fractures of the acromion process: A proposed classification system. J Orthop Trauma. 1994; 8:6-13. 12. Kurdy NM, Shah SV: Fracture of the acromion associated with acromioclavicular dislocation. Injury . 1995; 26:636-637. 13. Lecoq C, Marck G, Curvale G, Groulier P. Triple fracture of the superior shoulder suspensory complex. Acta Orthop Belg. 2001; 67:68–72. 14. Lim KE, Wang CR, Chin KC, Chen CJ, Tsai CC, Bullard MJ. Concomitant fracture of the coracoid and acromion after direct shoulder trauma. J Orthop Trauma. 1996; 10:437–439. 15. Liu AJ, Chen PJ, Shen PW. Triple injury to the superior shoulder suspensory complex. Form J Musc Dis. 2013; 4:81-83. 16. Mariño IT, Martin Rodríguez I, Mora Villadeamigo J. Triple fracture of the shoulder suspensory complex. Rev Esp Cir Orthop Traumatol. 2013:57:371-4. 17.Mulawka B, Jacobson AR, Schoroder LK, Cole PA. Triple and quadruple disruption of the superior shoulder suspensory complex. J Orthop Trauma. 2015; 29:264-70. 18. Ogawa K, Naniwa T: Fractures of the acromion and the lateral scapular spine. J Shoulder Elbow Surg. 1997; 6:544-548. 19. Ogawa K, Yoshida A, Takahashi M, Ui M. Fractures of the coracoid process. J Bone Joint Surg Br. 1997; 79:17–9. 20. Ogawa K, Matsumura N, Ikegami H. Coracoid fractures: therapeutic strategy and surgical outcomes. J Trauma Acute Care Surg. 2012; 72:E20-E26. 21. Oshima M, Nakagawa Y, Mondori T. Complex injury patterns of the shoulder girdle three or four site injury. Shoulder Joint. 2003; 27:555-559. 22. Oh W, Jeon IH, Kyung S, Park C, Kim T, Ihn C. The treatment of double disruption of the superior shoulder suspensory complex. Int Orthop. 2002;26:145–9. 23. Rockwood CA: Injuries to the acromio-clavicular joint, pp. 680-910. Rockwood & Green 1stEd: In Fractures in Adults. JB Lippincott, Philadelphia, 1984. 24. Sung CM, Park HB. Triple disruption of the superior shoulder suspensory complex: case report at 5-year-follow up. Clin Should Elbow. 2012; 15:143-147. 25. Toft F, Moro F. Quadruple disruption of the superior shoulder suspensory complex and outcome after one yearof conservative treatment: a case report. J Clin Exp Orthop. 2016; 2:20. 26. van Noot A, te Slaa RL, Marti RK et al. The floating shoulder. A multicentre study. J Bone Joint Surg Br. 2001; 83:795-798. 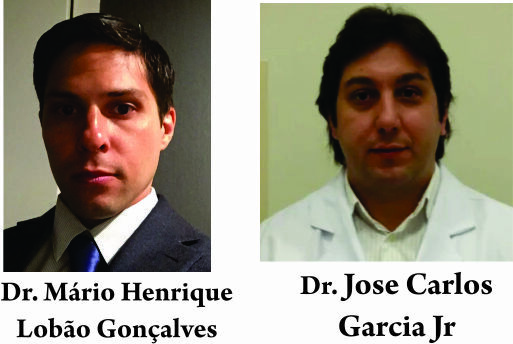 How to Cite this article: Gonçalves MHL, JC Garcia Jr., A Comprehensive Review of Triple Disruptions of the Superior Shoulder Suspensory Complex and Case Report. Acta of Shoulder and Elbow Surgery Oct – Dec 2016;1(1):56-61.